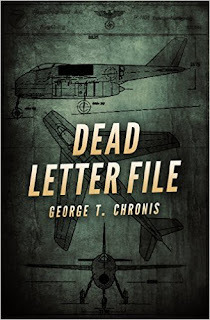 We were delighted to have an opportunity to interview George Chronis after reading his most recent book, Dead Letter File. It was a terrific book that I recommend to any mystery suspense fan. You can read my review of the book here. Mr. Chronis is currently on a virtual book tour with Partners in Crime Virtual Book Tours. You can see the full schedule of the tour here. Drop by on any day to learn more about the author and his book. The story introduces Tom Jarrett, a scriptwriter, who gets dangerously sidetracked investigating a murder. The Era is post World War II. He makes for an intriguing and likable hero, one I hope we see more of in future novels. Do get a copy of the book and enjoy it. In the meantime, here is a chance to meet Mr. Chronis. JLM: Can you tell us a bit about your journalism background? George: The intriguing aspect is that it was completely unplanned. I had come out of grad school during a nasty recession, the career doors I thought were available did not materialize and I ended up working in the marketing department of a major Southern California retailer. Having competed in debate and speech during college, the skillsets are complementary with reporting. So when managing in-house publications for the retailer came my way I ran with it. Moving on from that job I got offered a position working on a home video trade magazine. That led to a competing publication where I covered new technology and games. A couple of years later I got the opportunity to join a consumer computer games magazine in San Francisco and had a blast. Later it was back to trade press on the game industry side, and most recently editorial for a market research firm. JLM: How did that lead to a new career as a writer? George: Back in grad school I was in the screenwriting program. There were stories I wanted to tell and always wanted to circle back around to. But it was 15 years later before I got around to circling back and I did not have the interest in starting from scratch banging on doors in the film industry. There was also all of this reporting experience that gave me the idea I could tackle fiction writing blending the journalism and screen sensibilities. JLM: What led to your passion for the mid-1900’s? George: When I was a kid, and before cable television, the local stations broadcasted a ton of movies, cartoons and serials from the 1930s and 1940s. I simply fell in love with them. That’s how I could ask Leonard Nimoy the first time I interviewed him about where he thought his career would go when he was an unknown in a Republic Pictures serial, Zombies of the Stratosphere. JLM: I see you are writing a sequel to Sudetenland. Do you plan on a series perhaps? Any hints of what the sequel will include? George: Yes, it is a series, but without a series name. The last quarter of Sudetenland is alternative history that sets up a very different Cold War that starts brewing 10 years early. Each installment will explore a different crisis in that Cold War. The first sequel follows directly on the events in the first book, but later installments may jump a year or two. While there is plenty of intrigue that continues in Europe, the actual crisis takes place in Asia so expect a lot of atmosphere and drama in what were the Japanese colonial territories. JLM: In Dead Letter File, it was a fascinating time, between the horrors of the war, the following Cold War, and patriotism that surrounded it. Does your knowledge of the time period come from accumulated knowledge, since you’ve loved the period? What sort of research did you have to do to enhance what you knew? George: One of the other things I liked to do as a kid was read history. My parents always got the morning and afternoon newspapers, so I devoured those, as well. A lot of the Los Angeles material comes from having grown up there, plus stories my father would tell me about the 1940s. Most of the research was making sure I had not gotten something wrong. The historical hook came from a magazine article I had read as a teen and kept. I did more research on that front later since there really is not a whole lot on the subject and I wanted to give Jarrett some extra background in the book. Then there was some really fun research for Mary – even simple things like her clothes. I did not always know the proper name for some items. But then I discovered there are folks out there collecting and preserving old sewing patterns and they became a wonderful window on how to confirm names of specific styles. JLM: Do your plans for books stay in that time period? George: Not exclusively. There is one that takes place in the 1890s, and two that are current day. The trouble is getting around to them. 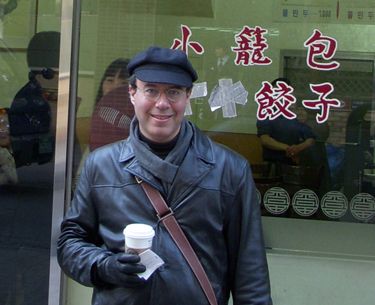 JLM: How do you enjoy writing fiction compared to journalism? What’s harder/easier? What is the hardest part for you when writing? George: Well, there is nothing quite like the terror of having two sections to fill in a weekly news magazine on a slow week. You basically have between Monday morning and Wednesday afternoon to fill those holes. On the plus side you are dealing with a strict format that encourages economy and efficiency and impact. Fiction, by contrast, provides a more open canvas to fill in as you please, as long as you can do so successfully for the reader. Fiction is harder from the standpoint the stakes are higher and there are more opportunities to veer off into a ditch, but I would not say the writing itself is harder. In both disciplines it is a blast when you get on a tear and the words and concepts are just flowing out. JLM: Do you outline in detail, in general, or see where the story takes you? George: I like to plant down the beginning, end, and major story points in between. That usually gives me the freedom to expand and adapt as the narrative evolves. JLM: How much time do you spend getting to know your characters before you are ready to write about them? George: As I am old fashioned, I prefer exterior threat. That gives me the luxury of seeing how they grow over time under serious challenges. Pretty much I have a target persona worked out and then add texture as I get to know them better. JLM: Does your research sometimes take you somewhere you hadn’t planned on going? George: More often than not research confirms a supposition I already have or add more meat to the idea. Characters are the ones who take me into uncharted territory. In Sudetenland, the whole Vienna act developed because I fell in love with Ros and wanted to give her more to do. Dead Letter File is a much more compact work, but I had a similar involvement with Mary that led me to add a larger role for her, which led to some major changes to the plot. JLM: Do you keep a list of ideas for future books? Or is it more copious notes before you are ready to start? Is it a big list? George: Mostly it is ideas that come up that I store in my head. For me it is all about storytelling. When a subject presents itself that I know would make for a great story, I make a mental note and start a file where I put the idea and other material when it develops. Usually this is something that is a bit off the beaten track. In Dead Letter File it is plans for a secret Nazi weapon that suddenly becomes very important. In Sudetenland, it is a side of the World War II era that many people have not come across before. So really it starts off with a good hook for a story and I add layers over time until I start research in earnest. JLM: What is your biggest distraction when writing? George: The lovely wife, the precocious pooch, the day job, the darling daughters, the Tales of Great Ulysses (what my cousin named the rendition of daily trials by an aging parent), or my own predilection to divert attention to a promising story lead rather than stay focused on the project in hand. George: The Law of Civilization and Decay, by Brooks Adams. JLM: If you are a 30’s film fan, do you have a favorite from that era? George: So many… but if I have to choose one, Only Angels Have Wings. JLM: What are you reading now? George: Under the Black Umbrella, by Hildi Kang. Thank you for taking to the time to talk to us, George! We wish you the best of luck with your book and the tour. The fog was lifting… not all at once but in small, scattered sections. Jarrett tried opening his eyes but was rewarded with pulsating colors in various shapes and dimensions. He closed his eyelids tightly and breathed in. The air tasted old and dusty like a moribund attic. The possibility crossed Jarrett’s mind that he might be hallucinating. There was only one way to find out for sure. Jarrett forced his eyes open a second time and waited for the pulsations to even out and his vision to focus. A light bulb was hanging on a wire from the ceiling above him. The Monarch was too new to sport one of these original electrical installations. That and the stale air told Jarrett he was someplace else, the question was where? As soon as he attempted to prop his arms behind him, Jarrett regretted the effort. “You should learn to listen,” Lydia crouched close to him, dampened the cloth and applied it to the sore area. “A little insurance policy,” Jarrett felt steady enough to reach back with one arm to pat her hand and gently pull it away from the hidden knife. “Like I said, I appreciate a man who comes prepared,” Lydia leaned back to gauge his progress. “Someplace none too prosperous east of downtown. They made so many turns it was hard to keep track where we ended up,” Lydia was glad nothing was busted permanently on the guy and he had his wits about him. “How long have I been out?” Jarrett felt good enough to sit up straight. “All day,” Lydia put the bowl down on the floor. “Yep… after we were thrown in here the mugs got extra concerned about your well being.” Under different circumstances, Lydia would be a little peeved she was not the primary object of attention. “Nice and tight. The windows back there are nailed shut too,” Lydia had even tested the window glass with her shoe but it was thick enough not to break. “Looks like we are not going anywhere,” Jarrett did not see many options available to them. “How are you feeling?” Lydia reached out grip his upper arm. “Good enough to wonder why I take risks saving pretty little numbers like you,” Jarrett attempted getting his feet under him to stand up. “You must be feeling better if you are throwing out compliments,” Lydia took her hand back. A wave of dizziness overcame Jarrett as he stood. Losing his equilibrium, he teetered precariously a few moments before toppling forward. “Ah hell,” Lydia rushed forward to catch the big lug. Wrapping her arms around him, she held Jarrett upright while trying to figure out what to do with him. Jarrett regained his composure sufficiently to realize his predicament and put his arms around her waist to help steady himself. “Only for special clients,” Lydia considered letting the clown drop to the floor when she heard the bolt lock unlatch behind them followed by the door flying open. The man that Jarrett had knocked unconscious back at the Monarch stepped into the room, a bandage applied around his wounded temple. Following behind him was a taller compatriot with a deep scar cut along his cheek. “Well, ain’t we cozy,” the assailant from the hotel room appraised his catch. After years as a journalist and magazine editor, George T. Chronis decided to return to his lifelong passion, storytelling. A lover of both 1930s cinema and world history, Chronis is now devoted to bringing life to the mid-20th Century fictional narratives that have been in his thoughts for years. Dead Letter File is his second novel. Chronis has also written Sudetenland, a historical fiction thriller set against the international crisis between Germany and Czechoslovakia during 1938. The author is already hard at work on a sequel. Thank YOU, George. It was a pleasure, as was your book. Best of luck with it! Thanks so much for introducing us to this author. Terrific interview! His new historical thriller sounds fascinating. it is a wonderful read Lance. Hope you enjoy it as much as I did.